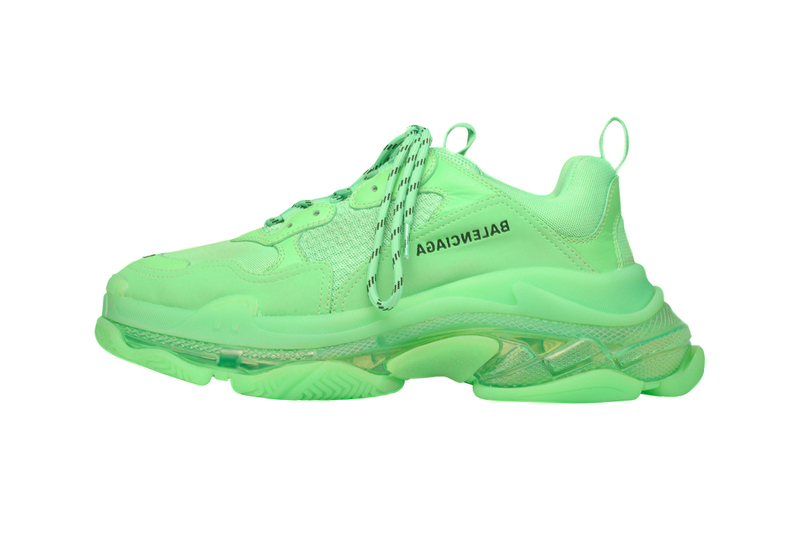 Balenciaga‘s trend-setting Triple S is no newcomer to the on-going chunky sneaker trend — the shoe’s influence on sneaker culture over the past year has been astounding, with a variety of other brands seeing the revival of similarly oversized and seemingly outlandish sneakers. Now, the unique silhouette has returned with a vibrant colored “Neon Green” base for the imprint’s Spring/Summer 2019 range — a color combo that is sure to turn some heads. The new colorway sports a holistically colored neon green base, with the materials utilized being doable foam and mesh, with leather accents marking the toe box, medial and lateral sides, heel, as well as the lacing regions. The upper is met with the ever-encroaching, madly-sized 3-layered outsole that sports a translucent base with more opaquely colored rubber near the midsole. As always, the sneaker retains the infamous branding hits on the sides, tongue, as well as the unique sizing stamp on the toe. Check out the unique iteration above, and if you’re interested in scooping up a pair head over to Balenciaga’s web store. The retail price is set at $995 USD. For more sneaker news, take an official look at the sacai x Nike LDV Waffle Daybreak. Taking a closer look into music’s influence on modern culture. Coming to the WarnerMedia streaming service.